Sunday Salon - Trying to play catch up! I'm finding it so hard to catch up with my reading. I didn't think it would be so difficult after just missing a month of reading...although I did read a few before I went into the hospital. With the weather being as cold as it is here in New York, and me not really being able to go out, you'd think I'd get a lot of reading accomplished. Not quite the case though. In any case, I guess, like my recovery, everything takes time. How do you all juggle your reading time? Stephanie Chisholm returns to her hometown of Pecos, Texas to attend her aunt and uncle’s funeral and settle their affairs. It’s not long before she learns that their deaths weren’t as accidental as she’d been led to believe and their will turns up, but quite a different version than the one she possesses. This one shows that her aunt and uncle disowned her completely, but this couldn’t possibly be true. It made no sense. Hank Dalton is quite taken with the appearance of Stephanie. When he realizes Stephanie’s life is in danger, he is determined to keep her safe. He has a bit of help, too. 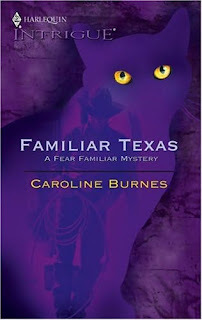 Stephanie hires the sleek black feline detective, Familiar, to uncover all the mysterious happenings at the ranch and to learn the true story of her aunt and uncle’s deaths. As always, I love this series and it’s always fun to have the handsome black cat, Familiar, on the scene. He makes me smile. The characters were very well developed and readers had an excellent feel for the setting of this book. I enjoyed it very much. So, I might be popping around to some of my favorite blogs which I've been missing! This is going to be a short Sunday Salon. I haven't really done very much reading this week, mainly because I haven't been concentrating very well. This week I'm going in for open heart surgery and my mind isn't 100% on reading. This will be my last blog post until I return home. I'm bringing books with me and hopefully I'll be up to reading them. Hope you all read many great books while I'm gone. 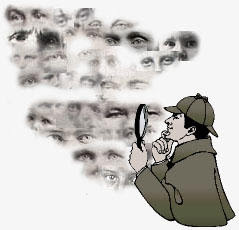 This book features four stories by four different authors. 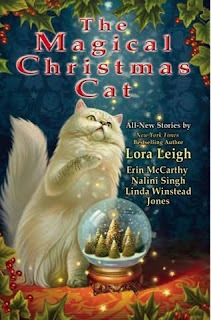 Each story involves some time of cat and the magic that surrounds them at Christmas time. When teacher Annie Kildaire meets one of student’s uncles, she finds herself immediately attracted to him. Unfortunately, he’s a Changeling who changes into leopard form and she’s a human. She knows a relationship between the two of them can never be anything but short term, but it’s hard to deny her feelings. It doesn’t help that her mother is dead set against the relationship and is busy trying to play matchmaker with a man she feels is more suitable for her daughter. This is part of Nalini Singh’s PSY/Changeling series. I’ve never read any of the books in the series or anything by this author, but it didn’t matter. I found her writing captivating and her characters very well portrayed. Bree and her two sisters are witches. When her younger sister predicts that the man of Bree’s dreams will be knocking at her door any minute, Bree is skeptical. When the man truly does show up, she’s flabbergasted. However, Ian isn’t entirely perfect. He’s there to make an offer, on behalf of his client, on the home Bree inherited from her grandmother. Bree has no intentions of selling and wants nothing more to do with the man trying to take her home from her. When Bree’s cat follows them around with magical mistletoe, she doesn’t know how long she can keep her distance from Ian. Erin McCarthy is a new-to-me author, but I do have her vampire series in my TBR. This was my favorite story in the anthology and I really enjoyed her writing. This was a fun story and made me smile whenever the cat with mistletoe showed up. Bake shop owner Ruby Kincaid discovers she has a secret admirer when she receives a mysterious gift at a neighborhood Christmas party. The gift is a statue of a black cat. Ruby is suspicious of all her neighbors, but particularly in Zane Benedict. He seems to be quite interested in the statue. She gives it to him, but somehow it winds up back in her house making her even more suspicious. Zane knows why the statue is given to Ruby and it’s definitely not a good thing. He fears Ruby is being targeted to be the next sacrifice in powers bigger then all of them. He is determined to protect his beautiful neighbor from the outside forces ready to take her away. 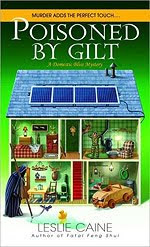 Linda Winstead Jones created a story with genuinely nice characters. I fell in love with Ruby and Zane. Their story was fun to watch grow. I’ll be looking for more stories by her. Librarian Haley McQuire is witness to a plot against the Breeds community. Immediately her life is in danger and so is everyone around her. When her library explodes and people close to her die, she is devastated. Noble Chavin, a Jaguar Breed, vows to protect her. He has loved Haley for a long time and has no intentions of losing her. I’ve never read Lora Leigh’s Breed series, but I’ve heard many good things about it. This story made me interested in reading more. It kept me at the edge of my seat with much adventure and romance. Most of my 2009 wrap ups have been put in other posts, but I'm going to try and condense everything here and add some more things. For 2010: I joined 10 new challenges, plus I have the 7 that are still running in 2010. For a total of 17. I'm looking forward to seeing what 2010 brings. This story spans of the life of Nella Castelluca beginning in the early 20th century. Nella is a fifteen year old girl who dreams of becoming a school teacher. Her dreams are shattered after her father has a serious accident and is unable to support the family. The Castelluca sisters are all forced to get jobs and work so their family can live and maintain their farm. Nella makes a name for herself working a local factory. At the young age of only 16, she becomes the forewoman at the factory. Nella grows into a mature, strong and very capable woman. She falls head over heels in love with Renato Lanzara, but when he suddenly leaves her, she’s shattered. She never expects to fall in love again, but sometimes the unexpected can turn out to be a beautiful thing. The Queen of the Big Time takes us through Nella’s life, we see are happiness as well as her sorrows. It’s a very emotional read or at least it was for me. I listened to the audio version of this and actually was crying as I was on my way to work. I had to pull myself together or my co-workers would have thought something really bad was wrong. LOL Any book that can effect me like that is really special. It’s been a long time since I reacted that way to a book. Each character was so vividly portrayed and I had an excellent feeling of an Italian/ American family lifestyle. I really can’t say enough good things about this book. Actually, I better add it to my Great Book Alert for 2009 since I finished it in 2009. 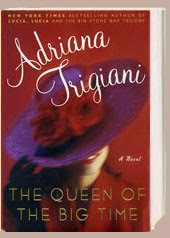 Trigiani is definitely an author I will be looking to read again. Here is the challenge for 2010. Remember you need to read a different book for each one. Good luck! a.. Read a book by an author whose last name starts with the letter "B"
A total of 8 book, which is pretty much average for me. As you can see I tried to keep with the holiday theme all month. The audios were the only non-holiday books. My favorite book this month? Usually I can't choose just one, but this month I think my favorite was very unexpected. I absolutely loved The Queen of the Big Time. I never read anything by Adriana Trigiani and when I saw the library had an audio book by her, I decided to give it a try. I'm glad I did and I'm definitely going to keep an eye open for this author. I haven't written my review yet, but I'll do that over the weekend.